The state racing authority delays action on moving races from Santa Anita. ARCADIA — The California Horse Racing Board on Monday delayed a planned meeting to discuss the possibility of relocating races away from Santa Anita, in light of nearly two dozen horse deaths at the facility since December. On Monday, however, the board issued a statement saying the Friday meeting had been scrubbed. According to the board, the discussion of Santa Anita racing will be placed on the board’s agenda for April 18, a meeting that will be held at Santa Anita. No reason was given for the delay. Racing went off without a hitch at Santa Anita over the weekend, which included Saturday’s running of the Santa Anita Derby, won by trainer Bob Baffert’s 3-year-old colt Roadster. The lack of any action by the board means that this Sunday’s scheduled Tokyo City Cup and Japan Family Day activities will be held as planned. 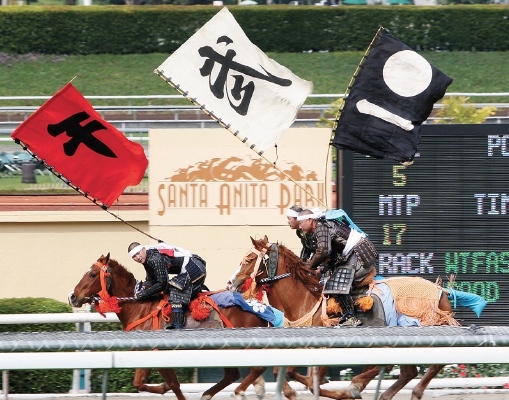 Santa Anita Park, a sister thoroughbred racetrack of TCK Oi Racetrack in Japan, will host the 24th annual Tokyo City Cup, a $100,000 Grade III race that brings together some of the top thoroughbreds in the nation. The Tokyo City Cup, won last year by Hoppertunity, is the sole graded stakes race named for a major city outside of the United States. Along with this race, the annual spring Japan Family Day will be held on the site. It celebrates a long partnership between two of the premier tracks in the world with a wide variety of Japanese cultural exhibitions, food booths and travel information on Japan. Among the day’s attractions will be karate, tea ceremony, calligraphy, kendo and origami. Visitors can enjoy anime and stage performances including minyo (Japanese folk songs), sumo wrestling, Okinawa traditional dance and taiko. On hand in traditional kimono for photos will be Tokyo City Cup Ambassador Chikako, known for her role in “Terrace House,” the popular reality television show on Netflix set in Hawaii. Entertainment for the little ones includes games, pony rides and face-painting. The variety of Japanese food booths will offer sushi, curry rice, okonomiyaki, ramen, Japanese tea, barbecue, onigiri and Japanese baked goods. At the beer garden, Japanese beer will be served and sake-tasting will be presented by Hakutsuru. A free Tokyo City Cup T-shirt will be given to the first 1,200 patrons and more gifts for fans who complete a survey at prize drawing tables are available. The Tokyo City Cup Game will be held with prizes including a Nintendo Switch. Gates open at Santa Anita at 10:30 a.m., with first post at 12:30 p.m. For more information and schedules, visit www.tokyocitycup.com or www.japanfamilyday.com.